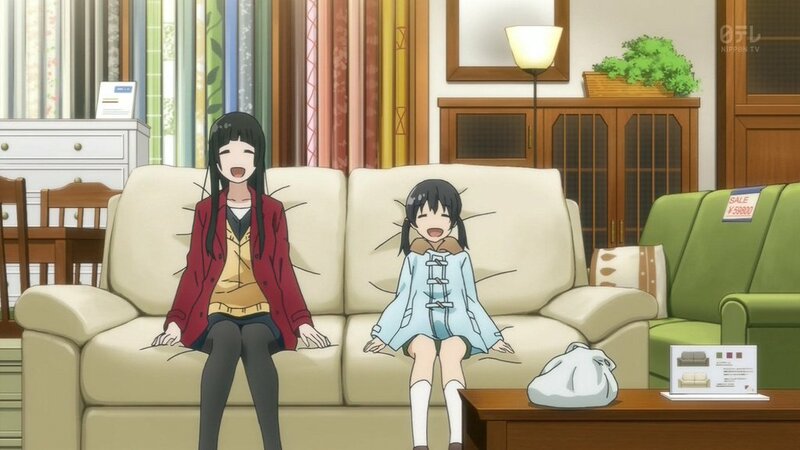 I love me some comfy, slice-of-life shows and Flying Witch is one of the comfiest shows I've ever had the pleasure of watching. Makoto Kowata, our protagonist, is a professional witch in training, and has come, along with her black cat Chito, to Aomori to live with her cousins and study up on whatever it is witches do. A show where every single character is a joy to watch, with standouts being Makoto's adorable young cousin Chinatsu, Makoto's older sister Akane, and Inukai, who got really really drunk and ate some sweets which turn her into a dog during daytime. 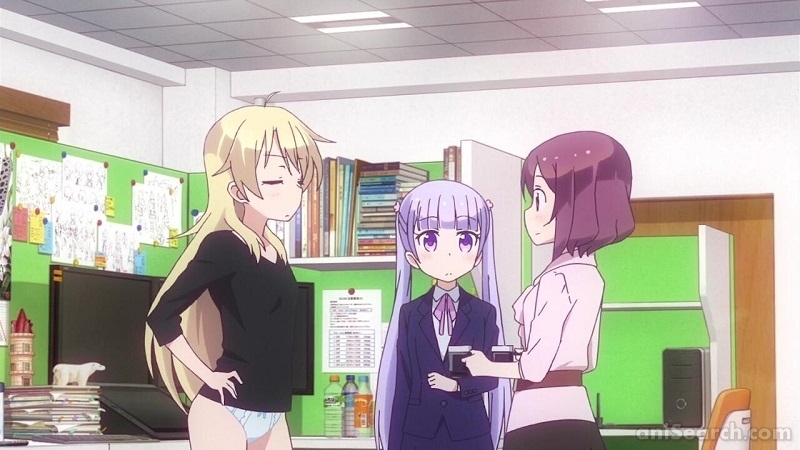 As well as the great, relaxed moments you'd expect from the slice-of-life genre, the show's comedy is also top-notch, with an impeccable sense of timing, and the way the show subtly marries it's supernatural elements with the more mundane, everyday life stuff works really well. Kouhei Inuzuka is a high-school teacher, who, after the death of his wife, now lives alone with his preschool-aged daughter, Tsumugi. Her mother was the cook of the house, so lately, the Inuzuka family have been living mostly off of ready meals. After deciding he wants to give his daughter a good meal for once, the two find themselves at a small family restaurant owned by the mother of Kotori Iida, one of Inuzuka's high-school students. What follows is a show about the three of them (and occasionally a couple of other friends) learning to cook a good meal and eat it together. Though I feel the show falls into the trap of getting a little formulaic at times, there's a lot to like here. Tsumugi is adorable (helped in no small part by being voiced by an actual child), and the show throws in some melancholic moments that I admit caught me off guard. 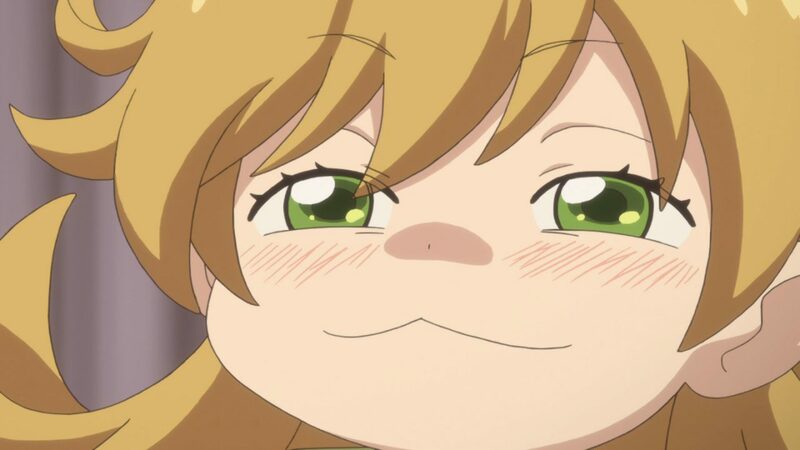 Sweetness & Lightning is up there with Bunny Drop as shows that might make you want to consider become a father (you know, if I had someone to do that with...). 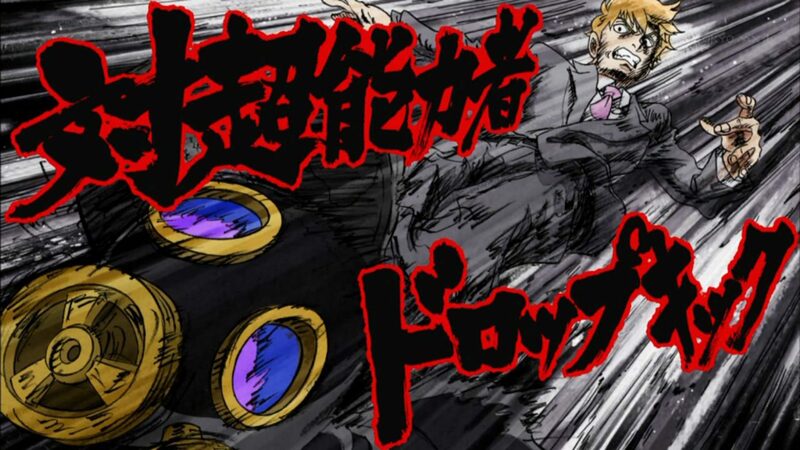 "This is one of Reigen's special moves, where he dropkicks an esper as hard as he can." Last year brought us One Punch Man, an adaptation of the manga written by an artist who goes by the pseudonym ONE. This year brings us Mob Psycho 100, ONE's serialised manga, adapted by the prolific studio Bones. If you enjoyed OPM, you'll likely enjoy MP100, as I feel it does a better job at creating an interesting story and characters, while still maintaining a good sense of comedy. One Punch Man is the manga that ONE writes as a hobby... a mangaka for fun, much like the titular character. Mob Psycho 100, however, is ONE's actual job... and it shows. Bones also does an incredible job at adapting ONE's eh... unique artstyle into something that just looks sublime when in motion. Re:ZERO is the story of Subaru Natsuki, who finds himself suddenly transported into an alternative, game-like, fantasy world, because of reasons. Soon after entering this world, he meets a half-elf girl named Emilia, whom he immediately takes a liking to and decides to help her recover something that was recently stolen from her. At the end of this small quest, the two of them are brutally murdered. And then Subaru wakes up, back where he originally started. He discovers he has a unique ability to essentially travel back to a pre-determined point in time, memories/knowledge intact, but can only invoke this power by dying. 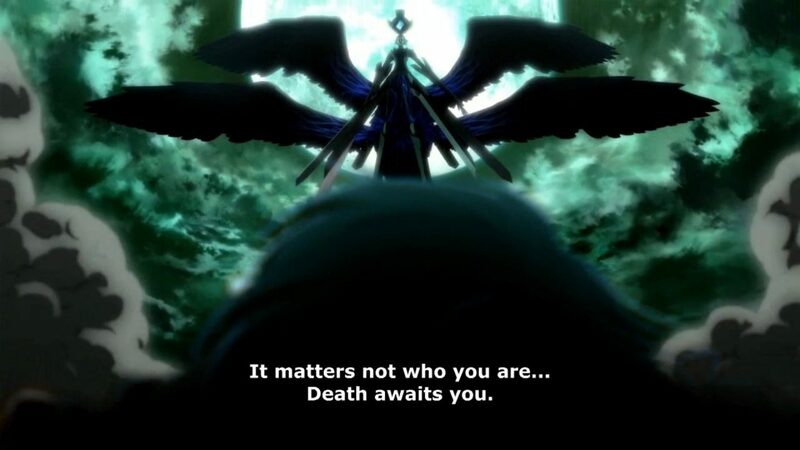 The show does some interesting things, delving into the effect that constantly dying and reviving can have on that person's mind, as well as doing interesting things with the tropes often found in these "isekai" (alternate-world) shows. Subaru, our main character, isn't particularly likeable, but they do some great stuff with his character later on in the show that helps justify it, and there are plenty of other, immediately likeable characters in his place. 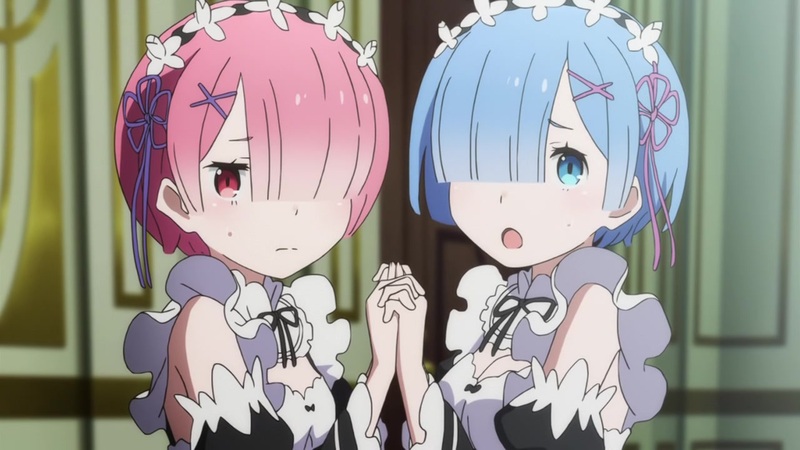 Re:ZERO also contains what might be my favourite single episode of an anime from this year. It isn't quite the faultless, 10/10, anime-of-the-year-all-years that some of the fanbase were hyping it up as during its airing, but it's definitely an interesting show, and I look forward to watching more if future seasons are greenlit. 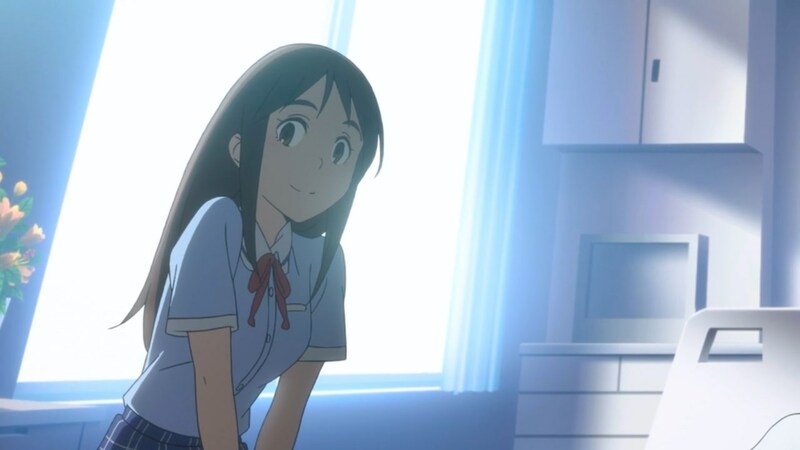 I couldn't find an interesting screenshot, so here's a picture of best girl. ERASED or, in my opinion, the much more interesting Japanese title Boku dake ga Inai Machi (The Town Where Only I am Missing) introduces us to 29-year-old Satoru Fujinuma, who will inexplicably find himself time leaping back a few minutes whenever a fatal accident is about to occur, a strange power he's used to save multiple people's lives. However, someone close to him gets murdered, and being suspected of doing it himself, Satoru funds himself sent back 18 years, to 1998. It's here that he realises the murder in the present may be connected to the abduction and killing of his classmate Kayo Hinazuki. And so unfolds the story of Satoru trying to discover what really happened all those years ago, as well as prevent the death of his classmate. ERASED is probably one of the shows this year that would probably work well among western audiences that aren't familiar with anime. It isn't laden with cliche anime tropes, and tells a plot that honestly wouldn't be out of place in a western TV show or Hollywood movie. The conclusion feels a tad rushed in my opinion, but overall, ERASED is a pretty fantastic show that is well worth watching. Tanaka's life in a single image. Tanaka is, as the title would suggest, an incredibly listless young man. He enjoys nothing more than lying about doing nothing. His hobbies are sleeping. 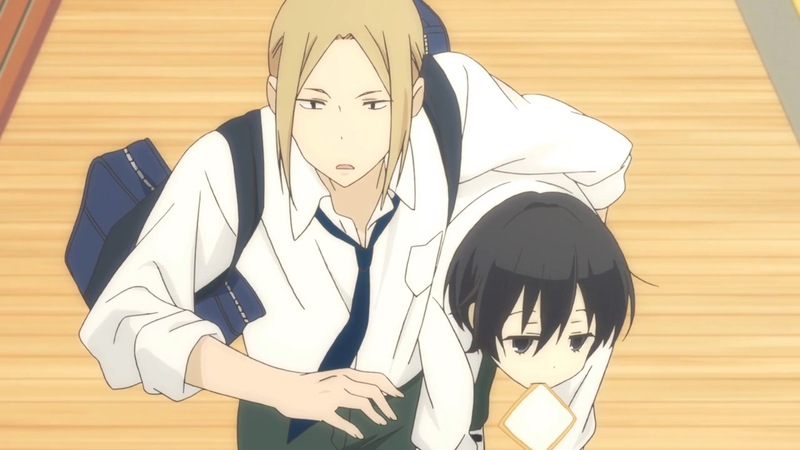 The show follows Tanaka, his best bro, Ohta, as well as a few other friends and characters that are steadily introduced in their relatively uneventful daily lives at school and beyond. For a show whose protagonist is a guy who would gladly do nothing more than sit around all day doing nothing, it does a good job of staying pretty engaging throughout, thanks in no small part to it's wonderful cast of characters. There's the tiny, adorable and incredibly energetic Miyano, who for some reason greatly admires Tanaka's listlessness and wants him to make her his apprentice. There's Echizen, the abrasive tomboy who really likes cute things. There's the incredibly popular and attractive Shiraishi who goes through great effort to hide the fact she's a normally plain and boring looking girl. It's also a nice looking show, with a focus on a softer, pastel colour palette, obviously tying in with the whole relaxed nature of the show. 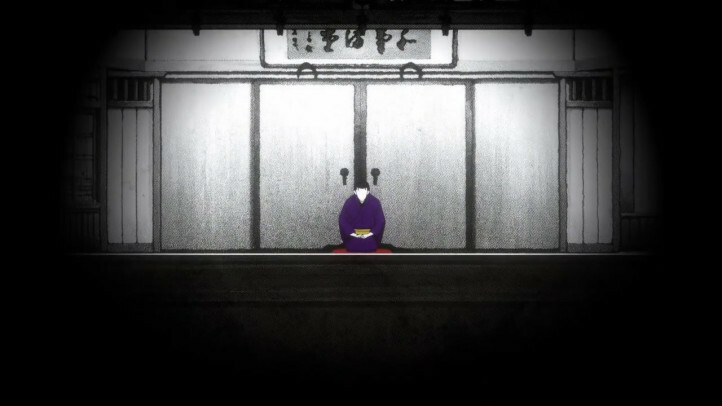 Also my favourite opening animation from this year. Yotarou, a former yakuza has just gotten out of prison. He isn't interested in returning to that life though: he wants to become a rakugo performer. Rakugo is a traditional form of Japanese comedic entertainment, where a performer sits on a stage and, using nothing more than their voice and a couple of generic props, tells a funny story, often long, and featuring multiple characters. Whilst in prison, Yotarou was inspired by the performances of Yakumo Yuurakutei, and begs him to make Yotarou his apprentice. Yakumo eventually gives in. Under Yakumo's care is a young woman named Konatsu, whose deceased father, Sukeroku Yuurakutei, was another performer, and Yakumo's best friend and rival. The rest of the series takes place in the past, telling the story of how Yakumo and Sukeroku met, and became rakugo stars. A truly fantastic period drama, the show is probably my favourite of the entire year. Fantastically developed characters, incredible performances by the voice actors, and just an overall well-told story. It ends with us returning to the present, with the second half airing in early 2017, which I await with bated breath. "The Arcana is the means by which all is revealed." The conclusion to the anime adaptation of one of my favourite video games of all time. Although I would need to probably marathon through them again to be 100% sure, I think this final movie my be my favourite of the four. There's a section of the film where the cast have, for lack of a better term, lost their way, and it's just dripping with atmosphere, dominated by oppressive colour palettes. I love me some atmosphere. Plus the fact it's the conclusion to a pretty great story. Although the film series as a whole suffers from the same thing most video game adaptations do (that is, a lot of stuff not being included), since you're compressing an almost 100 hour game into 4 90 minute films, it's still an overall great experience. As mentioned earlier, alternate-world (or isekai) anime are all the rage lately, and KonoSuba is another one of those. But the thing that sets it apart is that it's a comedy, through and through. Our protagonist, Satou Kazuma, is a high-school-aged NEET, who on his way back from buying a new game, dies a pathetic and hilarious death. He then meets the (rather obnoxious) goddess Aqua, who gives him the choice of either continuing on to heaven, or reincarnating in an alternate-fantasy world, with the choice of any item to take with him. So he chooses the fantasy-world, and chooses to bring Aqua with him, dragging her off her throne. Turns out, Aqua isn't very useful in this world, her only magic abilities limited to water-based party-tricks. Their party eventually grows to include Megumin, a young arch-wizard who loves explosions so much so knows only the most powerful explosion magic... which incapacitates her for the rest of the day when she casts it, and Darkness, a crusader and massive masochist, who dreams of being ravaged by men and monsters alike. It also turns out the fantasy-world isn't quite as cushy as it might be in games, as Kazuma and Aqua find out, having to sleep in the stables and struggling to make living expenses. 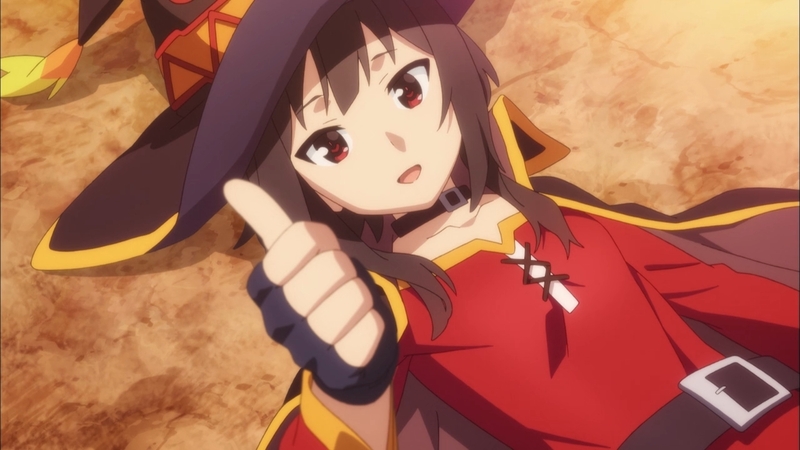 Comedy is obviously very subjective, but KonoSuba hits all the right marks for me, a show that gleefully plays around with the fantasy tropes so common in other shows and games. If only real game studios had cute girls hanging around in their undies. And we end my top 10 with a 100%, bona fide show abut cute girls doing cute things. Aoba Suzukaze is fresh out of high-school and is now working at Eaglejump, the company that made an RPG she loved when she was still in grade school. She quickly finds herself working as a character artist, making 3D models of NPCs for the studio's newest RPG. Comparison might be initially made to last year's Shirobako, however, those two shows have very little in common. You're not going to learn anything meaningful or genuine about working in game development from New Game! Like I said, this is a show about cute girls and the cute things they do. And it has that in spades. There are a handful of other anime from this year that I watched and enjoyed, but just weren't quite up to the task of making the top 10. Amanchu! is a wonderfully sweet show from the director and mangaka that brought you the fantastic Aria series, Space Patrol Luluco is more fantastically unbridled nonsense from those lovable goofs at Studio TRIGGER, Orange has a lot going for it, but was ultimately let down by the two main characters being (in my opinion) the least interesting of the main cast and Food Wars! The Second Plate is more Food Wars, which is great, but it's only half the length of the first season and the pacing is kind of all over the place. Enjoyable, but doesn't quite make the cut. The first Kizumonogatari movie is really, really good, but as a movie, it just doesn't stand up on its own, since all it really does is set up the rest of the story. There's also a handful of anime from this year that have my interest, or I was planning on watching, but haven't gotten around to, mostly from the Fall season: Sound! Euphonium 2 is the second season of my of favourites from last year, Drifters is a show from the same mangaka of Hellsing, and Gi(a)rlish Number seems to be a funny and incredibly cynical look at the anime industry. And that's it for this years look at the animes I thought were alright this year. See you again in 2017!